As a senior who just graduated from Bowling Green State University, the most important thing I wish I had known is to take in every waking moment of your four years. There are so many important aspects of college, and BG really has the potential to give a great college experience. Coming into your freshman year, remember that all of the other freshman are in your shoes as well. It is completely normal to feel nervous, to feel homesick, to have questions and to second-guess things. Always use your resources. The faculty and staff of this campus are extremely genuine and are always there to talk. With that, embrace your feelings and thoughts and do your best to get involved. You will find your bubble in BG – join clubs, meet people in classes, become a member of Greek life. There are endless opportunities and there are many places you will fit in. As much as you may want to go home and spend weekends with your family or high school friends, this is the time to embrace change. You will learn to love the people here and your new home with time. Before you know it, you won’t want to go home for breaks. I did not have the slightest desire to join a sorority, and only went through recruitment to be a buddy to my roommate. In the end, we joined two different sororities, doubled our group of friends and completely changed our college careers for the better. Don’t be afraid to try. Along with adjusting to your new life at Bowling Green, remember your studies will be different from high school. As hard as it may be, learn to manage your time so you do not become overwhelmed at one given point. Manage time so you can get your work done, study and be prepared for class and exams. The least amount of stress, the more you will enjoy your time. If you are having trouble with assignments or the material being taught, there are many places to seek help here at BG, which I wish I would have used more. Depending on the class, you can always ask your professor who can either directly help you or direct you where to get help. It is better to get help right away then to get in too deep. Make sure you pay close attention to what classes you take, and try not to take classes that will not benefit you in the future. It is easy to take classes that you enjoy and it may seem ideal, but you might end up with too many required classes for specific semesters in the future. Meet with your advisor whenever you are questioning what to schedule and monitor it yourself as well. Take any opportunity to volunteer, intern or work in field experiences associated with your major. It’s hard to believe, but senior year will come before you know it and you will be fishing for items to write on that extremely important resume. Work on it and add to it along the way. Something very important that I wish I was warned about is how easy it can be to lose sight of your true purpose of being in Bowling Green during your freshman year. School comes first! With that, I ask you to be extremely careful on the weekends and choosing the decisions you make. I will admit that I learned that the hard way as a freshman, so take my advice now. Have fun, but be smart. Taking all of this into consideration, live every moment like it is your last. 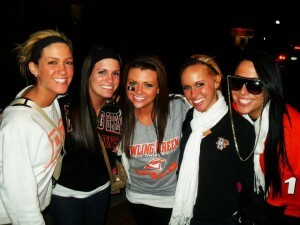 Enjoy your college years here at Bowling Green State University.